Here are some funny and helpful tips on giving your cat a bath (if you even dare to or are forced to because you can’t stand the stench of your cat anymore or if your cat has fleas). Good luck and may both of you come out alive. How to give a cat a bath after the jump. Next, the cat must be dried. Novice cat bathers always assume this part will be the most difficult, for humans generally are worn out at this point and the cat is just getting really determined. In fact, the drying is simple compared to what you have just been through. That’s because by now the cat is semipermanently affixed to your right leg. You simply pop the drain plug with your foot, reach for your towel and wait. (Occasionally, however, the cat will end up clinging to the top of your army helmet. If this happens, the best thing you can do is to shake him loose and to encourage him toward your leg.) After all the water is drained from the tub, it is a simple matter to just reach down and dry the cat. In a few days the cat will relax enough to be removed from your leg. He will usually have nothing to say for about three weeks and will spend a lot of time sitting with his back to you. He might even become psychoceramic and develop the fixed stare of a plaster figurine. You will be tempted to assume he is angry. This isn’t usually the case. As a rule he is simply plotting ways to get through your defenses and injure you for life the next time you decide to give him a bath. This entry was posted on Thursday, May 10th, 2007 at 3:55 am	and is filed under Cats, National Dog, Cat & Pet Info, Entertainment About Pets. You can follow any responses to this entry through the RSS 2.0 feed. Both comments and pings are currently closed. LOL! I had to give a cat a bath for skin treatments, and after one episode as above, came up with an alternate plan. I figured out that my cat was more afraid of a *tub full* of water than being wet. Fill a large bowl (I use the family popcorn bowl — don’t tell my husband) with body temperature water. Soak a beach towel in it, until the towel is dripping wet. Place the bowl and a water pitcher or large cup in the tub, then go get the cat. Climb in the tub holding the cat, THEN close the shower door. 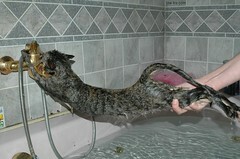 Put the cat down in the dry tub. Carefully and quickly drape the dripping towel over the cat and step back. By the time the cat struggles out from under the towel, he will be soaking wet and ready for shampooing. Rinse with the cup using the water from the bowl. God! That was good! I needed a good laugh this morning. Been there done that! The only thing I do different is I have a stiff drink before I begin!!! One thing I like to do is after the bath is over and done with, keep some treats handy. Once they’ve had enough time to plot and plan my demise, I shake the treat container. They come running for their compensation. Words of praise about how they handled their aquatic abuse like a champ are also necessary (you did just bruise their ego, after all ;). Cats like the water very warm. They hate getting cold. If you use cool or cold water to bathe them you deserved all those scratches. I have no trouble bathing 2 of my three cats. The difficult cat has a handicap which makes him afraid of being held down to bathe. I know this was a humor piece, but I had to give some tips. I am still gasping for air! SO funny!!! Now we need a set of instructions on how to give a cat a pill IN the bath. THANK you Itchmo; I really need to laugh so hard more often. Haven’t had to bathe a cat in years, but I have scars…. Reminds me of the one that said to hold kitty soothingly in your arms while stroking him and crooning to him as you step into the bathroom. Make sure the shampoo for kitty is out and ready first of course. Then put kitty into the clean toilet that has been filled with the shampoo. Promptly close the lid and sit or stand on it. Flush a few times to rinse. Do not be mislead by the noises kitty makes, he is really enjoying the entire process. When finished, make sure nothing is blocking the door, and stand to one side as you open the lid. Kitty is sure to run straight out as hard and fast as possible, and you do NOT want to be in his way! One of my cats had a small injury to her paw. In addition to antibiotics, the (rather young) vet suggested, very casually, that I soak the paw in warm water for 15 minutes every day. I should have known better than to even attempt the procedure. I can attest to the fact that it is physically impossible to hold a cats paw in a bowl of water for 15 minutes. We decided wrap in damp towel was sufficient. I will be attempting to bathe my cat this weeked and I know it will be hell. We brought him back when he was 01 year and since then we realised that he is scared of everything, he doesn;t even leave his room and doesn’t allow us to pat him or go near him. He might have had a bad experience at the pervious home. So wish us luck in trying to get him to shower! !